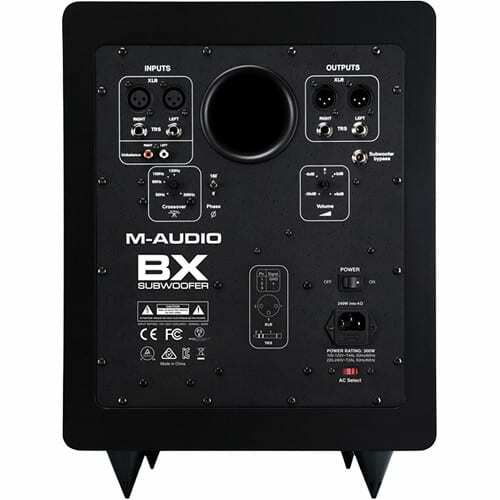 Allowing you to extend the frequency response of your M-Audio or other monitoring system down to 20 Hz, the BX 240W 10″ Subwoofer from M-Audio features a 10″ composite woofer and sweepable crossover frequency between 50 and 200 Hz, allowing you to customize the unit’s performance to match your system and needs. 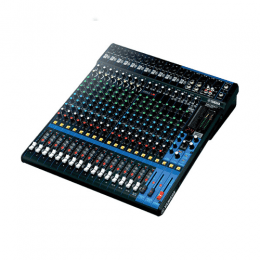 It has both stereo XLR and TRS inputs and outputs for a variety of connectivity options, and is constructed of resonant-free materials and heavily braced to reduce vibrations. 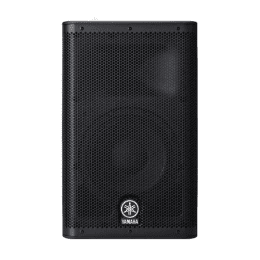 For quickly comparing bass performance with and without the subwoofer engaged, the BX subwoofer can be turned on and off via the included footswitch. Its phase inverse switch allows for proper phase alignment regardless of where you place the unit. 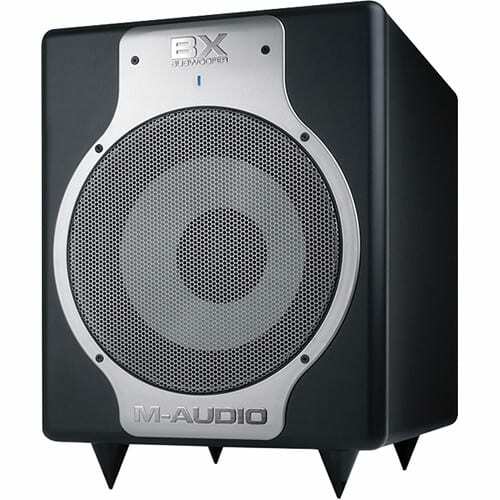 Designed for use with the M-Audio M3, BX Carbon and BX D2 series, the BX Subwoofer delivers deep bass response necessary to optimize the lower frequencies in your music, film and multimedia projects. Many of today’s personal audio systems can reproduce very low bass frequencies, so it’s critical that your audio production environment allows you to monitor and adjust those frequencies while you’re mixing. 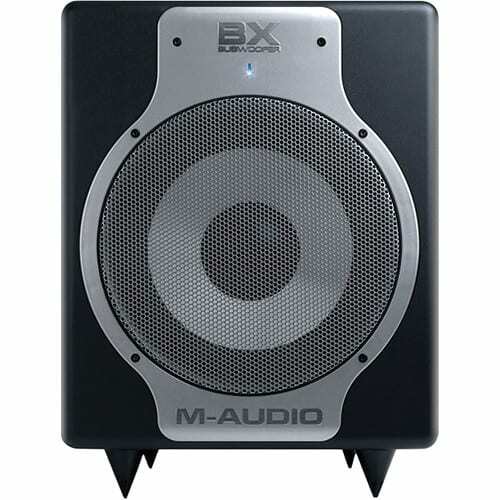 Studio monitors like M-Audio’s BX5 Carbon are designed to work as full-range monitors. Yet when they are asked to reproduce extremely bass-heavy material at high volumes, it can be taxing on the speakers and fatiguing to the listener. 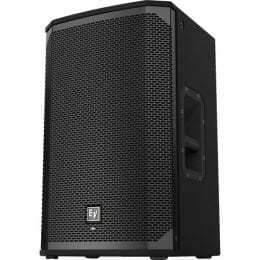 When they’re used in tandem with the BX Subwoofer however, the system comfortably reproduces full-range signals at significantly higher levels without any audible stress. 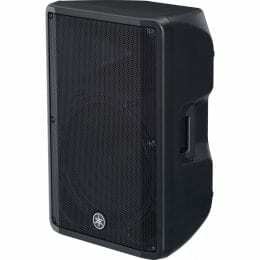 This is because the active HP/LP crossover in the BX Subwoofer acts as a “traffic cop,” directing low frequencies to the subwoofer and only letting those frequencies above the user-chosen crossover point to go to the satellite monitors. When the satellites are relieved of the burden of trying to reproduce the deep bass with their modest 5″ woofers, they can play at much louder levels with markedly lower strain and distortion. The entire system now plays cleaner, louder, and with greater detail, which means you’ll get cleaner audio information and make better mixing decisions. 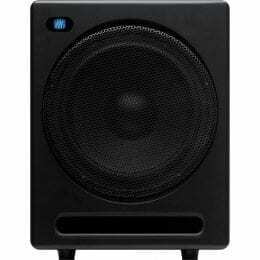 The BX Subwoofer accepts two-channel stereo outputs from your mixer, audio interface or sound card. 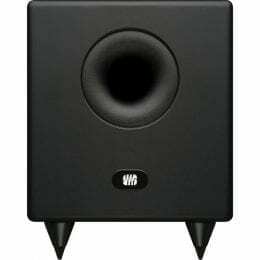 Your main L/R monitors connect to the subwoofer’s outputs. As stated above, the internal crossover network of the BX Subwoofer splits the signal at a user-chosen crossover frequency ( between 50 to 200 Hz), routing everything below to the sub and everything above the crossover point to the main L/R monitor speakers. The steep 4th-order HP/LP filters (24 dB/oct) can improve your system’s overall fidelity because they limit the amount of “overlap” between the subwoofer and the satellite, thus minimizing phase-related frequency response cancellations and other crossover-induced anomalies. 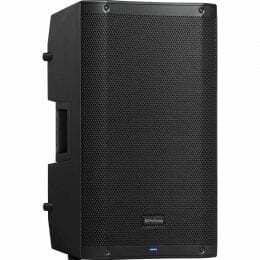 This assures that each component only has to deliver frequencies to which it is ideally suited: deep bass for the BX Subwoofer, and mid-bass/midrange/treble for your near-field monitors. The 10″ driver features an oversized magnet for higher sensitivity (“efficiency”) and a high-temperature, long-throw voice coil, delivering maximum low frequency output and optimized power handling. 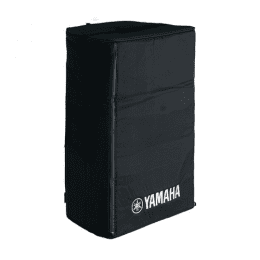 Box Dimensions (LxWxH) 21.339 x 20.315 x 17.323"